Description: Two white porcelain teacups with gold design and trim. 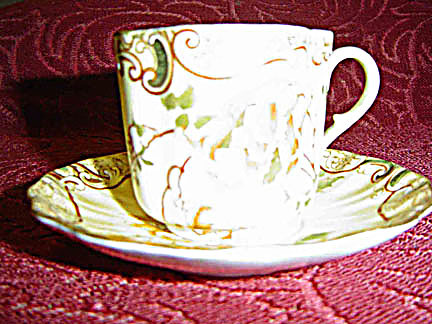 Two white porcelain saucers with gold trim. Handed down to Annie Krause from A.J. Mathies, her father (and her step-mother), after she was already married. Her parents, Abram J. & Margaretha (Dück) Mathies immigrated to Canada from Schönfeld, Russia in 1924, crossing the Atlantic on the “Minnedosa”.